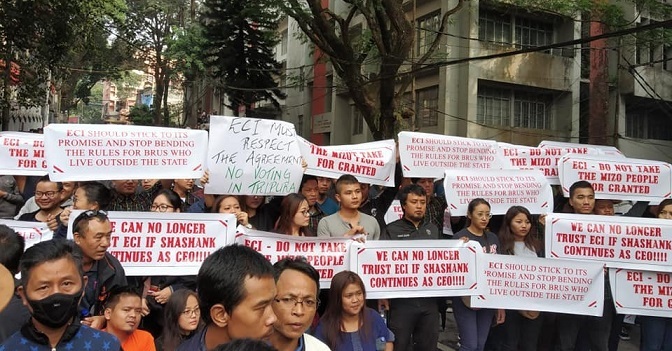 Over 50,000 members of the Young Mizoram Association volunteers on Tuesday turned up for the Save Mizo Nation movement demanding ouster of Mizoram CEO SB Shashank. Over 50,000 members of the Young Mizoram Association volunteers on Tuesday turned up for the Save Mizo Nation movement demanding ouster of Mizoram CEO SB Shashank. Series of high level meetings are on to solve the Mizoram stalemate. Angered by the removal of Lalnunmawia Chuaungo from the principal secretary of Mizoram and the alleged involvement of SB Shashank volunteers of the YMA in thousands gathered at the gates of the office of the Mizoram CEO. “The CYMA is left with no choice, the protest march or the Save Mizo Movement today can be a catalyst of so many political moves, but what we want is to safeguard the integrity of the Mizos,” CYMA president Vanlalruata said. The NGO Coordination Committee, an umbrella committee of all the larger NGOs of the state has demanded the resignation of SB Shashank, the CEO of Mizoram, whom they accused of trying to give possible franchise to the Brus settling in Tripura which the NGOs of Mizoram detested. Normal life in Aizawl came to a complete halt with all civil societies and business organizations backing the initiative of the NGO Coordination Committee. Schools were closed and government machinery was forced to shut down without any untoward incident in Aizawl which clearly showed that the movement was well supported by the people. The Election Commission of India, knowing the gravity of the situation has deputed L Khiangte, Chief Electoral Officer, Nikhil Kumar, Director, ECI, S B Joshi, Secretary, ECI to monitor the situation in Mizoram. But the meeting of these did not yield any concrete result.